AllegroMedical.com presents the Spa-N-A-Box Portable Spa as seen on QVC. 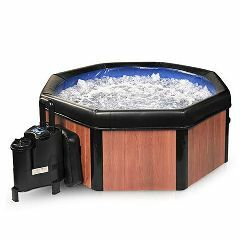 This portable hot tub is an easy, affordable way to let your stress melt away and enjoy a soothing spa experience anywhere, anytime. The portable Spa-N-A-Box sets up in about 20 minutes and plugs into a regular household outlet. Its micro air-jets provide a vigorous body massage to soothe aching muscles — at a fraction of the cost of traditional hot tubs. Spa-N-A-Box is great for those suffering from arthritis, chronic pain, knee problems, back pain and fybromyalgia. Or, just use it to relieve stress, RELAX and have fun! Use indoors, outdoors, in your sunroom, on your patio or deck, in your condo or apartment. Take it on vacation, or on the road in your RV. Put it on your boat! Do you have a vacation home? Cabin? Lake House? Use it anywhere! Assembles in Three Easy Steps!!! Thermal locking cover is included! Important Note: For delivery of Spa-N-A-Box Portable Spa, a signature is required. The Spa can not be left on/at a front door. Daily Use. Reduce Stress. Ease Pain. I got this tub 5 years ago with the expectation the novelty would wear off after a few months but it didn't! I use it 4 to 5 times a week to relax after work. I needed a tub I could get up into my family room over the garage and this was the perfect solution. I have tried others at friends and on vacation and I love mine the best. Easy to maintain. I have had to replace the motor after 4 years and it is not recommended for more than 2 people at a time in the tub, but if you take care of it it will take care of you! Durable. Dries Quickly. Easy To Clean. Mold Resistant. A necessity for folks with fibromyalgia, and also for those who just want to relax and enjoy life a little more. [...] instructions are easy to understand, the product was quickly set up and in use. The only problem, and certainly not something that would change my opinion of this great value product, is that the blower fan is noisy....its like having a vacuum cleaner running next to the spa. This isn't a problem when sitting IN the spa, as the pleasant rushing sound of the bubbles overwhelms the blower fan, but it would make using the spa at night in a suburban or urban setting very noisy and intrusive. The manufacturer should develop a lower decibel air system or design a sound reduction enclosure. This would make sense given that this one issue, noisy fan, is about the only consistent negative in all the reviews of this product, and again, its not a deal breaker, just something that should be updated. That aside, this is an excellent value and I would recommend it highly. It is literally thousands less than a traditional spa, and a great way for someone to evaluate if that kind of investment is even necessary at all. This is one of those rare products that does exactly what it claims to do, at excellent cost.The seller might consider providing information that explains various chemical and natural spa treatments and how to use them, as the user manual deals only with traditional chemicals. The kit sold with the spa on the internet is a traditional chemical kit, but some excellent alternative products are available for people sensitive to traditional products, and they should sell these products also, as they are becoming more popular, according to local spa retailers. Soothing. Effective. Simple to Use. Durable. Easy To Clean. Mold Resistant. Dries Quickly. High Quality. Good Value. Reduce Stress. Daily Use. Ease Pain. we took out our kitchen table and replaced with the spa-n-a-box spa. Awesome! Use it every night! My wife and I have a hot tub outside, and we stopped using it when we bought the spa-n-a-box hot tub, inside with air conditioning! We keep it set on 100 degrees. It has run non-stop for 3 years. We LOVE IT!!!!!!!!!!! Soothing. Simple to Use. Effective. Good Value. Reduce Stress. Daily Use. Ease Pain. Patio. Outdoors. Budget Buyer. Value Oriented. Homeowner. Professional. We bought this item is a luxury item to help with my husband's aches and pains. He loves it and Sits in it at least once or twice a day and I sit in it once daily as well. It was easy to get-together and hold its temperature very well. The floating insulator and cover work great and keep it clean and tidy. We have had ours for a month and are still trying to get the chlorine and water levels balanced, but overall is low maintenance. We call it our starter hot tub and eventually may get something more expensive, but this is great for someone who doesn't want to spend over thousand dollars and really needs a great relaxation tool. This is a great buy and I have already recommended it to several friends. I would say three people at max that you would want to sit in there, unless you want to be very cozy. Two of us fit in there very comfortably . I just set my system up but the pump is not holding water i the top tube and will not heat up.did iSet it up wrong? is it possible to use 2 ..another one on top? make it deeper???? what would the shipping cost be for us here? We live in Montreal Quebec, can be very cold - would this be appropriate for our winters? What is the seating situation? I know the temp goes from 80 to 104 but is it possible not to have the water heated at all? Can I purchase just the heater and blower unit. I have a good shell but the heater went bad. I am 89,severe arthritis. Would have one heck of a problem getting in, sitting inside, getting out. Are accessories, such as steps, inside seat,grab handles available as optional extras? No, there are no accessories. This would be a problem for anyone with severe arthritis. wOULD THIS TUB STILL BE HOT ENOUGH AT -25 F. OR WOULD IT BE TOO MUCH FOR THIS TUB TO HANDLE ??? No it would not be good. We live in northern Michigan but close it up for fall and winter because it cost too much to heat plus it isn't built to withstand winter. What is the highest temperature degrees? It reaches 104. This temperature is not maintained since the blower introduced outside air. After about 15 minutes the temperature of the water will drop to about 99. You then need to wait a few hours to get the temperature back up again.